I would like to learn more about this 2012 Nissan Altima 2.5 S. Please contact me as soon as possible! 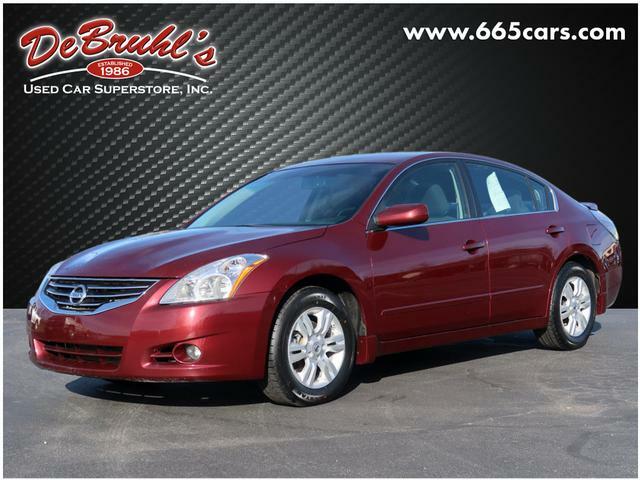 * TELESCOPING STEERING WHEEL * * GREAT DEAL AT $9,950 * * 2012 ** Nissan * * Altima * * 2.5 S * This 2012 Nissan Altima 2.5 S boasts features like a push button start, traction control, AM/FM radio and CD player, anti-lock brakes, dual airbags, and side air bag system and will not disappoint. With a classic dk. red exterior and a charcoal interior, this vehicle is a top pick. Looking to buy a safer 4 dr sedan? Look no further! This one passed the crash test with 4 out of 5 stars. Check out the rear spoiler on this ride! Call or visit to talk with one of our vehicle specialists today! DeBruhls Used Car Superstore is the largest independent auto dealer in WNC! We offer a full range of financing with our guarantee credit approval, everyone is approved here.